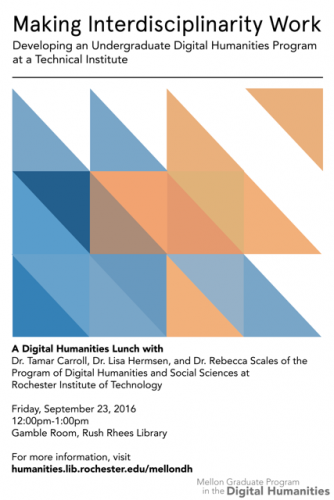 Digital Humanities Lunches are informal, lunch-time presentations about DH projects at the University of Rochester and in the surrounding region. 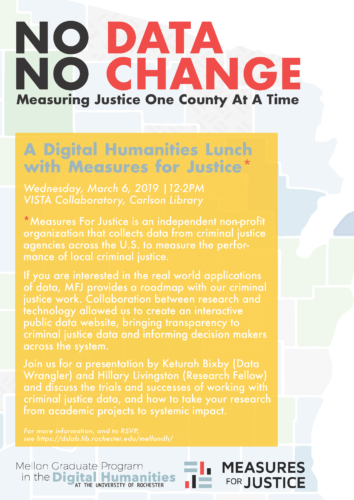 Measures For Justice (MFJ) is an independent non-profit organization that collects data from criminal justice agencies across the U.S. to measure the performance of local criminal justice. If you are interested in the real world applications of data, MFJ provides a roadmap with our criminal justice work. Collaboration between research and technology allowed us to create an interactive public data website, bringing transparency to criminal justice data and informing decision makers across the system. Working with multi-source raw data presents many challenges, but the methodology and tools we built allow us to standardize data and present it in a clear and contextualized manner for a wide range of audiences to utilize. 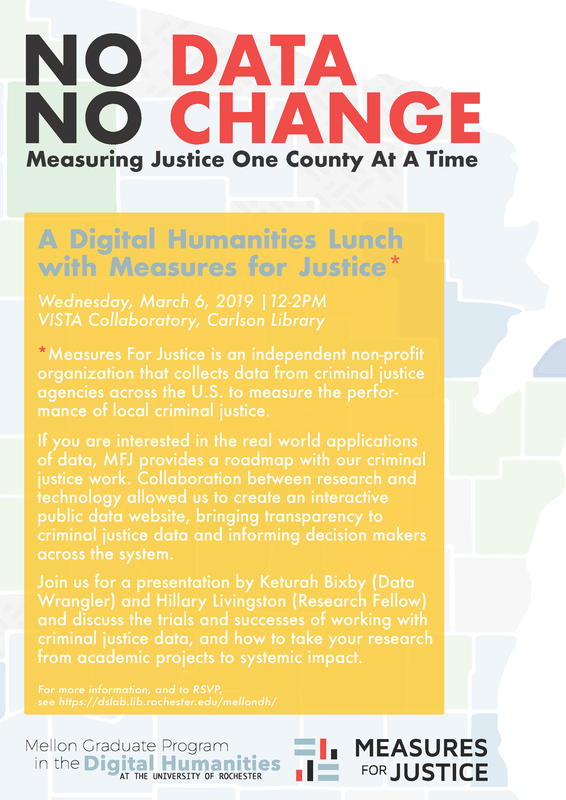 Come discuss the trials and successes of working with criminal justice data, and how to take your research from academic projects to systemic impact. 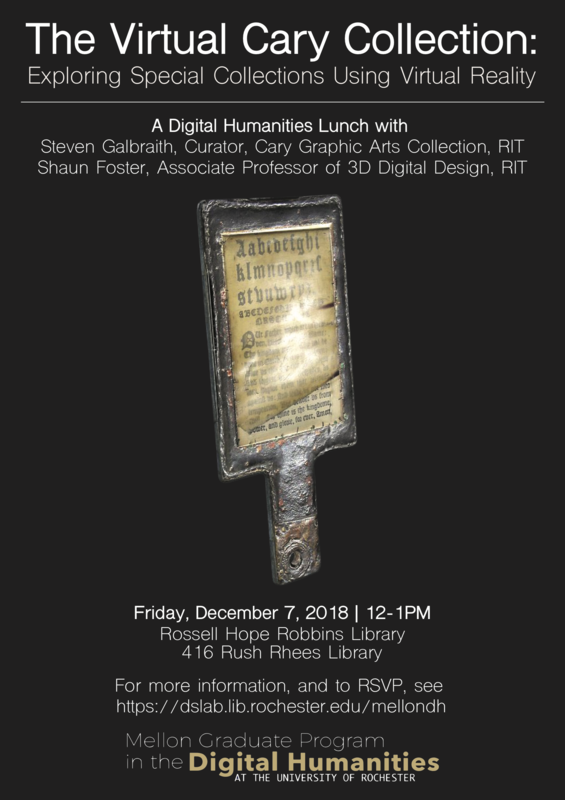 Join us for an interactive discussion on virtual reality and its uses in exploring special collections with Stephen Galbraith (Curator, Cary Graphic Arts Collection, RIT) and Shaun Foster (Associate Professor of 3D Digital Design, RIT). The Virtual Cary Collection is a digital humanities collaboration between RIT’s Cary Graphic Arts Collection and Department of 3D Digital Design. The project, an interactive 3D rendering of the Cary Collection, explores how VR can be used to promote access and discovery in libraries, archives, and museums. It investigates the research and teaching possibilities that are created when digitized artifacts are presented in a VR environment. RIT Professor Shaun Foster and Curator Steven Galbraith will discuss the project, its origins and long-term goals, and the technology used. Participants will be invited to experience the Virtual Cary Collection. 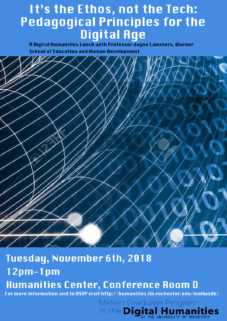 Please join us for a roundtable discussion on digital methodologies and the ethics of pedagogy and classroom practice with Jayne Lammers, Associate Professor, Director of Secondary English Teacher Preparation, and Associate Director in the Center for Learning in the Digital Age (LiDA) at the Warner School of Education. In this Digital Humanities Lunch, our guest offers ideas for us to consider about pedagogy in the digital age. Drawn from her research to understand young people’s digital literacy practices in informal spaces, such as Fanfiction.net and other online forums, Lammers will share guiding principles for designing engaging, collaborative learning experiences that focus on the ethos of online spaces, not the particular tools/technologies. We invite you to join in the conversation and think together about how you might be able to apply these principles in your own teaching. Lisa Nakamura is the Gwendolyn Calvert Baker Collegiate Professor in the Department of American Cultures at the University of Michigan, Ann Arbor. 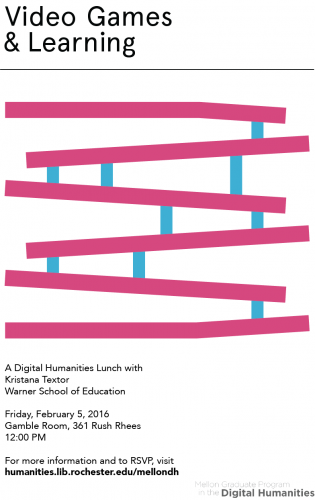 She is one of the leading scholars in the field of critical digital media studies/digital humanities. From coining the concept of “cybertype” as distinctive ways that the internet propagates, disseminates, and commodifies images of race and racism, to locating the internet as a privileged and extremely rich site for the creation and distribution of hegemonic and counterhegemonic visual images of racialized bodies, Nakamura has significantly contributed to the theory of racial formation in digital cultures. Her publications include Race After the Internet (2011, co-edited with Peter Chow-White) and Digitizing Race: Visual Cultures of the Internet (2007). 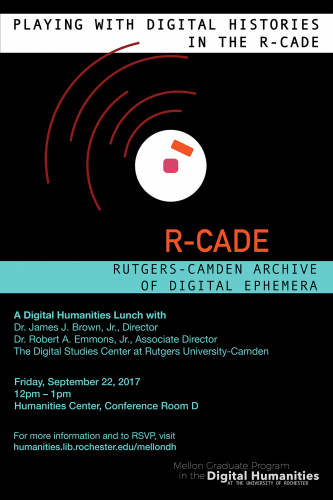 In 2014, Robert Emmons and Jim Brown launched the Rutgers-Camden Archive of Digital Ephemera (R-CADE), a collection of digital artifacts made available for research and creative activities. Scholars are free to take apart, dissect, and repurpose artifacts in the R-CADE as they attempt to understand their historical and cultural significance. While the R-CADE does not preserve in the sense of keeping objects in their “original” condition, the archive is in fact an exercise in the preservation of digital culture. The R-CADE has expanded and changed in the intervening three years, and this presentation will discuss the genesis of the project, its theoretical underpinnings, and how the annual R-CADE Symposium has grown. Emmons and Brown will share some of the work that has emerged from the R-CADE and will discuss some of the project’s future directions. 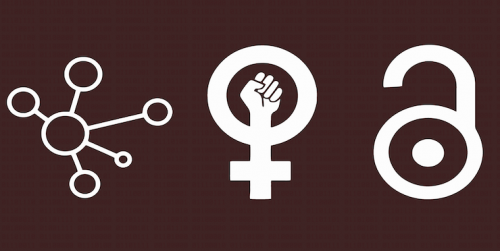 Responding to digital humanities’ issues with openness, race, disability, LGBTQ, feminist, and other kinds of non-normative bodies in the field, Dorothy Kim will outline a set of practical steps to #decolonizeDH, or to make it less white, heteropatriarchal, male, and ableist. She asks what are the field, departmental, and institutional steps to #decolonizeDH? 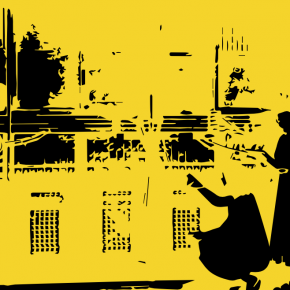 What are the considerations that must be addressed in terms of politics, local action, education, and resistance? Co-Sponsored by the Central New York Humanities Corridor, from an award by the Andrew W. Mellon Foundation, Department of Art & Art History, Department of English, Department of Modern Languages & Cultures, Film & Media Studies, Graduate Program in Visual and Cultural Studies, the Digital Scholarship Lab, and the Andrew W. Mellon Fellowship in the Digital Humanities at the University of Rochester. 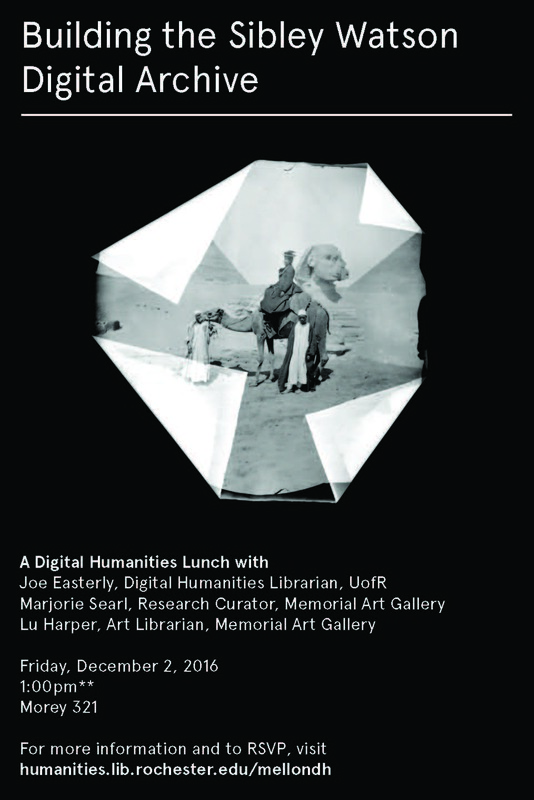 Please join us for an in-depth discussion of a new digital project due to be launched by early December: the Sibley Watson Digital Archive, a collaborative project begun in 2014 between the University of Rochester, the Memorial Art Gallery, and the George Eastman Museum. This archive is a scalable, extensible, standards-based framework for publishing family papers and related photographic material that exposes and unites hidden collections from multiple institutions, in a curated online environment allowing for multiple access points, and documenting the history of multiple generations of Rochester’s Sibley and Watson families. These families’ contributions to American culture and science are manifold: best known are Hiram Sibley and Don Alonzo Watson, who were instrumental in founding Western Union in the 1850s. Sibley’s daughter Emily Sibley and Watson’s son James Sibley Watson became husband and wife, and were responsible for the founding and later expansion of Rochester’s Memorial Art Gallery. Their son James Sibley Watson, Jr. was a radiologist, an important amateur filmmaker, and the publisher of one of the 20th century’s major literary journals, The Dial. During their talk, Joe Easterly, Margie Searl and Lu Harper will be discussing the challenges and rewards of collaborating on digital projects where the materials are spread across multiple institutions, as well as content specific to the archive, such as travel at the turn of the 20th century, and the role the Sibley Watson family played in the development of University of Rochester and its community. This fall, undergraduates at the Rochester Institute of Technology were offered a new major in the College of Liberal Arts: Digital Humanities and Social Sciences. RIT is among a rising contingent of institutions addressing the call for the integration of new technologies into humanistic and social scientific research. Reflecting the interdisciplinary nature of the field, RIT’s new major gathers faculty from the Golisano College of Computing, the College of Imaging Arts and Sciences, and the College of Liberal Arts. Textor delivered a talk on ‘Video Games and Learning’, in which she argued for the pedagogical value of video games. During a fellowship at the National Museum of Play in 2014, she researched ways for games to develop players’ understanding of gender roles. Her more recent work at the University of Rochester has included the creation of events reaching out to students and faculty from all departments, promoting the interdisciplinary potential of video game research. In May of this year, the University of Rochester River Campus Libraries announced their award of a $100,672 Officer’s Grant from the Andrew W. Mellon Foundation to support a pilot program: The Digital Humanities Institute for Mid-Career Librarians. This training initiative demonstrates the university’s growing investment in advancing interdisciplinary scholarly practices in a technology-rich environment and developing the leadership necessary for next-generation digital scholarship. On November 20, we welcome new faces in Rush Rhees whose work reflects the library’s mission to support digital humanistic study. 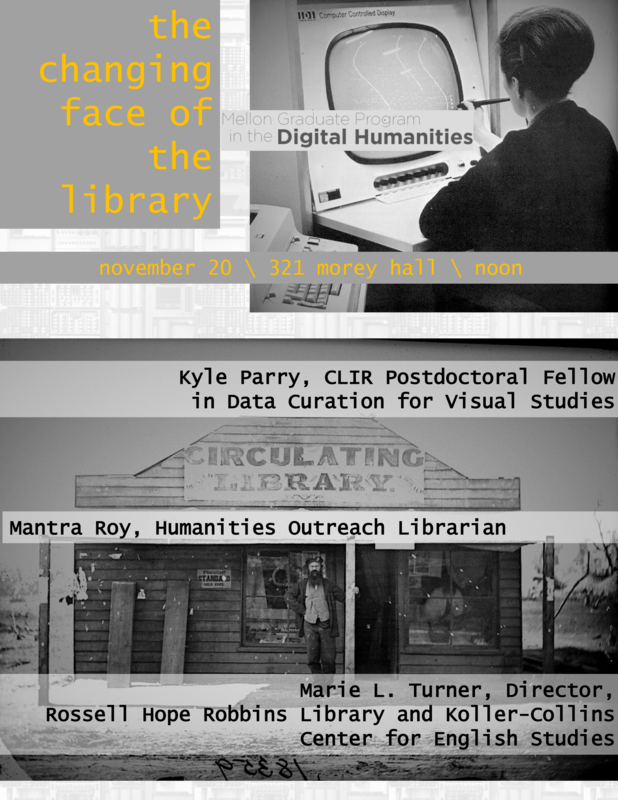 Our presenters include Kyle Parry, CLIR Postdoctoral Fellow in Data Curation for Visual Studies; Mantra Roy, Humanities Outreach Librarian; and Marie L. Turner, Director of Rossell Hope Robbins Library and Koller-Collins Center for English Studies. Our presenters on September 18 were Lisa Hermsen (Professor and Caroline Werner Gannett Endowed Chair of English) and Shaun Foster (Assistant Professor of 3D Digital Design) of the Rochester Institute of Technology. Hermsen, Foster, and a team of RIT students are building a complete 3D rendering of the former Buffalo State Asylum for the Insane, one of the largest and best examples of a “Kirkbride Plan” asylum in the nation, as it appeared in the late nineteenth century. Their DH project brings H.H. Richardson and Frederick Law Olmsted’s architecture to life as a fully accessible, participatory, and “restored” virtual complex. 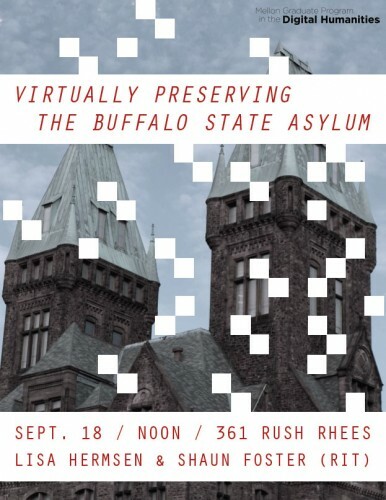 For more info about the project, visit: http://buffaloasylum3d.weebly.com.